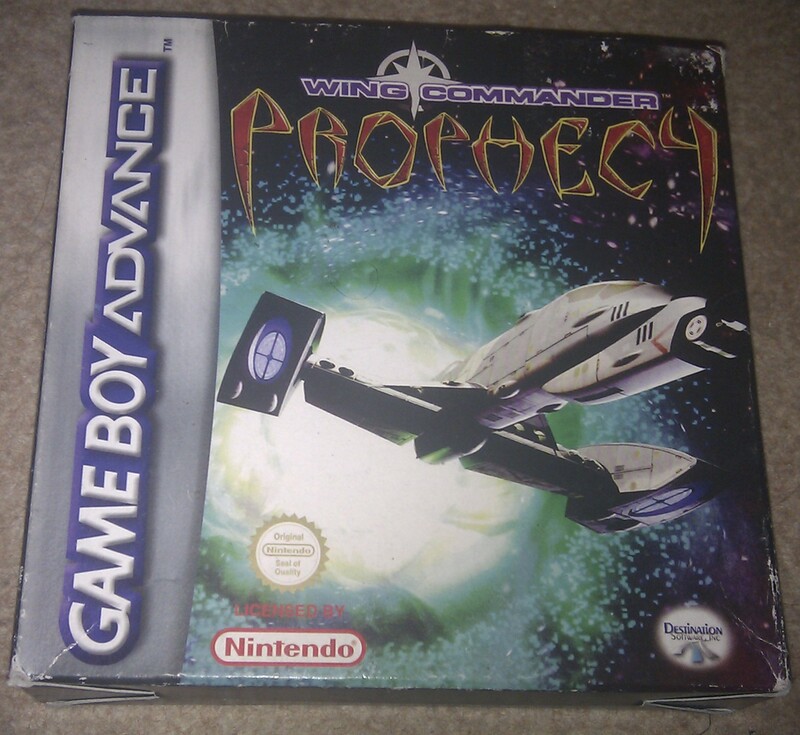 Wing Commander Prophecy was published on the Gameboy Advance in 2003 by Destination and developed by Raylight. From what I understand, Destination had previously secured rights from EA to publish mobile versions of their games. 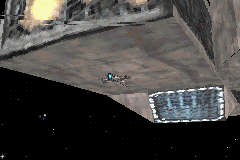 Raylight wanted to do a new Wing Commander game and created a demo of their shiny new 3D engine which was presented to Destination to persuade them to grant access to the license. 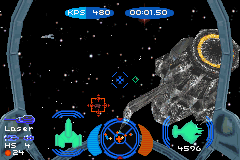 However, there were copyright issues for Wing Commander 1 with some work being done by contractors and owned by them (e.g. the Fat Man’s music). 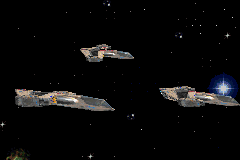 WC1 isn’t the obvious choice for a pure 3D engine either since it used sprites so in the end Raylight secured the rights to do Prophecy instead of the original Wing Commander and this game is the result. 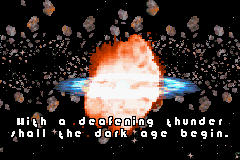 The Gameboy Advance was initially marketed at least partly on its 3D capabilities but not many games had exploited this making Prophecy one of the most technically advanced games for the system. 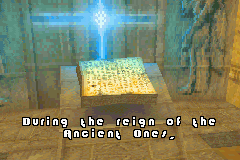 Whether this translates into the gameplay or not, just fitting the game into a ROM less than 4 Mb is impressive. 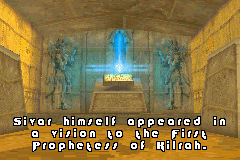 It gets underway with a 3D introduction cutscene which mirrors the opening FMV on the PC. On a tiny screen this doesn’t look too bad and it does the job of setting the scene within the limitations of the GBA. There is no speech of course and the dialog is done with captions. 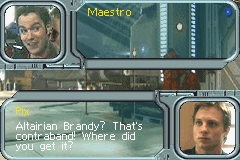 Once on the Midway, the in-game cutscenes are a little strange. They all have still backdrops with head photos which swap depending on the mood of each character. From what I’ve seen so far, the original script is nearly all there but I’m not sure how easy it would to follow if wasn’t already familiar with it as there is no context for a lot of the dialog. I assume this game is aimed at fans of the original who want to play it on the move, in which case it does the job. I have to mention the background music which has been the same for all of these scenes and is the most god-awful dirge I’ve heard in any game for some time. Not only that but its on something like a 6 second loop. If I’m utterly sick of it now, I can only imagine what I’ll be like after another 40 missions. I’m not going to be taking my time over reading the dialog in this game as my ears won’t take the punishment. 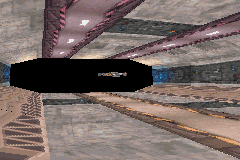 Music aside, I can wander around the usual rooms in the ship and get the familiar cutscenes (sort of). 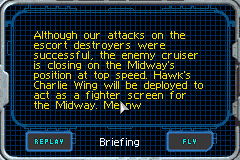 The briefing is a simple text only affair with no 3D wire-frame graphics but the missions themselves are based around the PC originals which I really didn’t expect. I was assuming it would be cut down but I gather there are 48 missions in the game. This could keep me occupied for some time. On launching into the actual flight part of the game, I’m impressed with the graphics which really do look like a tiny version of the original. 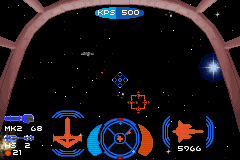 The launching sequence is present (complete with speech), my cockpit flashes with coloured light when I fire, the missiles all lock on correctly and all the different ships are there. It really is a portable version of WCP, admittedly with some cutbacks and simplifications. It isn’t without problems though. The biggest of these is that the GBA has two fewer buttons than the SNES gamepad and it shows in the controls. They aren’t entirely dissimilar to the SNES but the shoulder buttons are used as modifiers instead. This means that to change speed you have to hold R down and press up or down. This is awkward and the best of times and impossible to do while steering making tailing ships extremely tricky. Dropping decoys uses the select button which I often can’t find quickly in an emergency either. If someone fires a missile at you in this game you get about half a seconds warning in which time you need to afterburn, steer away and drop decoys and it is physically impossible to do all these at the same time. I initially started playing the game on my DS but found the controls so awkward that I went back to using an emulator instead. This is as much about the DS as the controls, it’s just too small for my shovel-like hands (anyone would think it was designed for kids). Playing this on the DS was like a miniature equivalent of twister for my fingers and they still feel sore a day later. Using a proper gamepad on an emulator is more comfortable but the graphics don’t look all that nice simply because of the larger screen showing them up. Another issue with the controls is once again the lack of analog input. I’d got used to this on the SNES but I’ve found it trickier here and my initial impression is that it hasn’t been as well implemented. 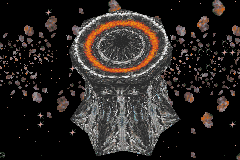 The aliens in Prophecy are a lot more twisty and turny and they are tricky to hit at the best of times. They don’t have the same problem with me however and if they get on my tail, I’m usually dead in seconds as they spam me with missiles. A final annoyance is that there is no way to lock onto a target and which target the game auto selects is almost random. With a tiny little radar, it’s really hard to keep track of each dot at times and it makes it difficult to find a specific ship again after it has gone out of sight. The auto selection doesn’t even limit itself to enemy ships and I often find it locking onto my wingmen which really doesn’t help. All this combines to make this game properly hard. It has required multiple attempts at most of the missions so far, and if you haven’t played a few Wing Commanders you would have little chance of getting anywhere. I wouldn’t say that it’s so much a case of learning how to approach the missions as just lucking out, although there is plenty of skill needed as well. I’ve got about 8 missions in and I’ve got mixed feelings about the game from what I’ve seen. It’s technically impressive but not as much fun as Secret Missions was as I’m fighting my own ship more than the aliens. I can’t see myself getting used to these controls in all honesty. With the shoulder buttons doubling as afterburners, I keep stopping my ship by accident when I steer straight out of an afterburn and it’s all a little frustrating. There is clearly a decent game in there but I’m struggling to get at it.